While General Motors has hinted as to what we can expect in terms of the 2014 Chevrolet Corvette Stingray quarter mile and 0-60 times, the folks at Motor Trend have published the first full batch of real world performance numbers for the C7 Corvette with a stunning 12.2 quarter mile and a 0-60 time under 4 seconds in a recent video. We have known for some time that the 2014 Chevrolet Corvette Stingray Coupe was expected to offer a 0-60 time somewhere in the 3-4 second barrier along with a quarter mile time in the 12 second range but thanks to Motor Trend’s Ignition Blog – we have our first look at the real world performance numbers of the mighty C7. The 12 minute video included at the end of this piece offers a great chance to see the new Stingray in action as it launches, revs and slides its way through the short video review from MT but aside from hearing the new Vette roar, the most exciting part of the video is the performance date gathered during their initial testing. The 2014 Corvette Stingray Coupe being tested by Motor Trend was the bright red beauty shown on the right, which is fitted with the standard 7-speed manual transmission, the Z51 Handling Package and the Performance Exhaust system that increases the output to 460 horsepower and 465lb-ft of torque. Motor Trend’s test drivers found that the Corvette Z51 is capable of running through their figure eight in 23.9 seconds while achieving 0.82g but more impressively, the team found that the new Stingray can achieve 1.11g of lateral acceleration – both of which are great numbers for the “standard” 2014 Corvette. Now, the odds are good that if you are an average driver, those numbers for the 2014 Corvette above don’t mean a whole lot but there are a few more parameters that any performance car junkie will easily understand – quarter mile, 0-60 and 60-0 braking. While the 2014 Corvette is equipped with a launch control system, MT got their best results without the aid of the launch control and honestly, I would expect that to be true with anyone who knows how to drive a car like this. Launch control is great for mediocre drivers but those who are skilled on the starting line will likely see better numbers when relying on their skills rather than electric doodads. Motor Trend was able to dash from 0 to 60 miles per hour in 3.9 seconds and while that is a touch slower than the 3.8 second figure that GM has mentioned – we should keep in mind that Motor Trend’s figures are based on a very short amount of time with the car. GM has spent thousands of hours testing this car in consistent conditions so we would expect that the automaker would be able to turn better numbers but in any case, the fact that MT was able to hit 60 in under 4 seconds is mighty impressive. Also, thanks to the huge braking system, the 2014 Corvette was able to get stopped from 60 miles per hour in just 104 feet – only 5 feet more than the 2010 Corvette ZR1 and only 10 feet more than the 2012 Corvette Z06. In short, Motor Trend was able to achieve supercar-like acceleration and braking figures with a well equipped “normal” Corvette. Finally, the number that many of you have been waiting for, the quarter mile time for the 2014 Chevrolet Corvette Stingray Coupe. On the Motor Trend test track, the new C7 Vette ripped through the quarter mile in just 12.2 seconds with a trap speed of 117.3 miles per hour. Based on those numbers and the relatively small amount of seat time logged by the Motor Trend crew, I would expect that we will have private 2014 Corvette owners breaking into the 11 second barrier in stock form with maybe just a good, sticky set of tires preventing an otherwise stock “base” Corvette from being a factory 11 second car. Also, that makes the standard 2014 Corvette just a few ticks slower than the 2013 Chevrolet Corvette 427 Convertible Collector Edition that used the Z06’s LS7 engine to run a 12 flat..ultimately showing just how impressive the C7 really is when unleashed on the real world. 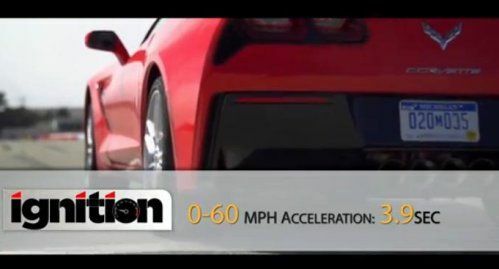 The video below from Motor Trend has 12 minutes of 2014 Corvette goodness from being thrown around the test facility to rocketing along real roads – all the while giving us our best look yet at the C7 Stingray in action.